Bengeance: But What Have We Done Lately? But What Have We Done Lately? A few days ago was the 40th anniversary of the first moon landing. From the Wright brothers at Kitty Hawk, to Armstrong and Aldrin on the moon, was only 66 years. It seems totally reasonable to expect that by this time we should have orbital space hotels and a Mars colony. But no. The last time humanity set foot on the moon was just about five months after I was born and since then, nothing. I mean, I like the Hubble and the International Space Station and all, but seriously, what have we been doing with our time? While I can't speak for humanity at large, I personally have been sailing on the Pinta. Well, a replica of the Pinta. 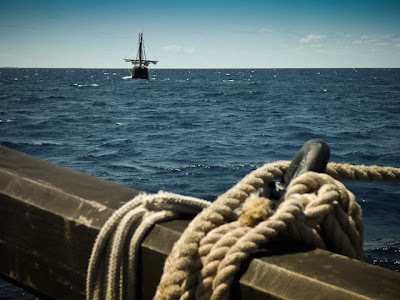 The Pinta was one of Columbus' three ships on his first voyage to the New World, along with the Niña and the Santa Maria. A replica of the Niña is with us as well, but we have no replica of the Santa Maria (perhaps because the original sank during Columbus' voyage?). I actually see a lot of parallels between Columbus' voyages and the moon landings. 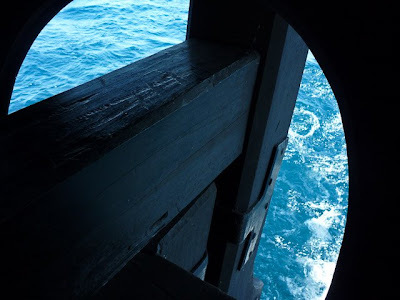 The Pinta and Niña are essentially a traveling museum. They are historically accurate replicas, built entirely by hand using authentic 15th century tools and methods. 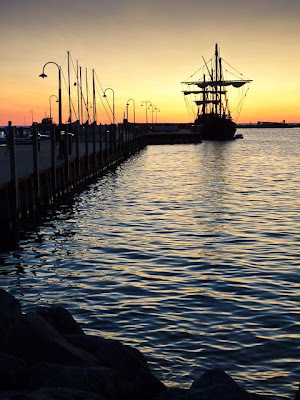 We sail from port to port, so that people can come on board and learn about the ships, and Columbus' voyages. The first thing most people say is, "I can't believe they actually crossed the Atlantic in these things. They're so small. People were tougher in those days." I beg to differ. Personally, I think that 500 years from now some guy will build a historically accurate replica of the Saturn V, and that little tinfoil moon lander (using authentic 20th century tools and methods) and fly it to the moon, just to prove that it could have been done. "Wow," people will say, "I can't believe they actually flew to the moon in this thing. It's so small. People were tougher in those days." The Niña and Pinta at the city marina in Petoskey, MI. The rudder in the water. The ships are steered via tiller. 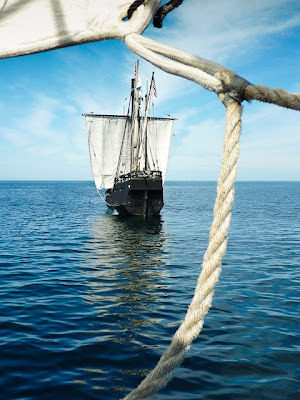 The Niña, seen from the Pinta, crossing lake Michigan enroute to Escanaba, MI. Main yard and furled sail. 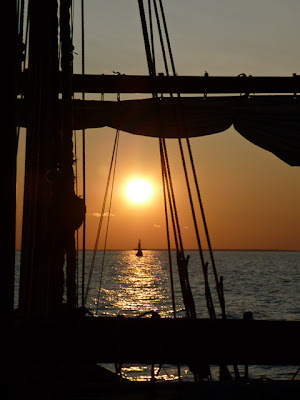 The Niña, seen from the Pinta, crossing lake Michigan. 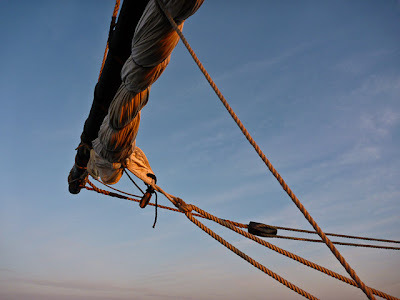 Sailing on the Pinta with our historically inauthentic jib. Block and tackle in the rising sun. 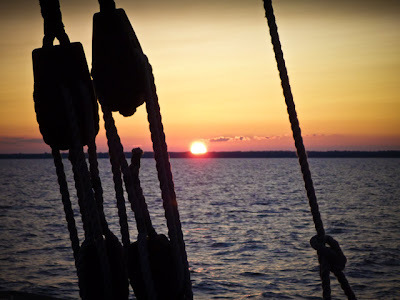 The Niña, seen from the Pinta, on lake Michigan enroute to Marinette, WI. P.S. For any of you in the Chicago area, we'll be in Waukegan, IL from July 29th through August 2nd, and in Michigan City, IN from August 12th through August 16th. OK, that's just cool!! Hope things are going well. People were tougher in those days. How does sailing that ship compare to driving a car? A bit more physical, eh? What have we done? Flown non-stop around the globe (not tougher, just cool), explored the ocean floor (tougher and cool) and hmmm??? 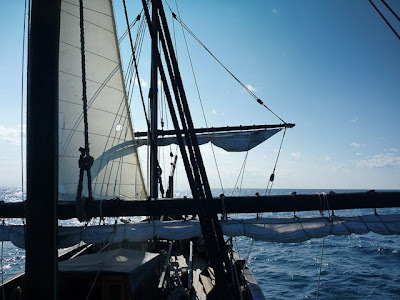 two of the 'crossing' photos don't show any sails unfurled - how much of your traveling is wind-powered? The other day I was wondering what life would have been like on the ships if I'd gotten on in Michigan City like the Captain wanted me to. Maybe nothing would have been different, but then, maybe everything would have. Oh well, no sense asking questions.